In more than 40 years of directing, Clint Eastwood has become a master storyteller. That is overwhelming evident in the first half-hour of “American Sniper,” Eastwood and screenwriter Jason Hall’s adaptation of Navy SEAL Chris Kyle’s memoir about his experiences as the most deadly sniper (160 confirmed kills) in U.S. military history. They waste no time in plunging us into the action: A street in Iraq. American soldiers searching door-to-door. 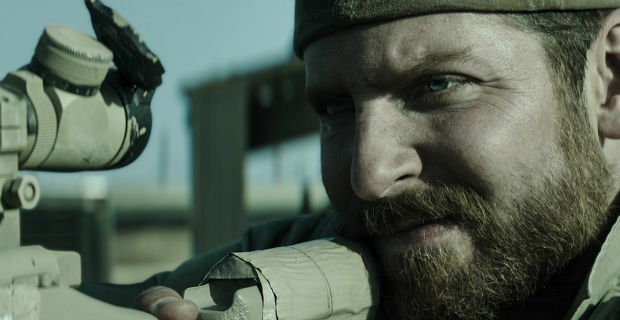 Watching from above is Chris Kyle (Bradley Cooper), new to the war and positioned on a rooftop. Suddenly Chris spots movement — an Iraqi mother and her young son are approaching. The mother produces a rocket-propelled grenade from her clothing and gives it to her son, who rushes toward the Americans. In seconds Chris must decide if his first kill will be a child. From that hair-raising intro, the film sends jerks us back to Chris’ childhood: reared as a hunter (and possible proto-survivalist) by his father, a misspent youth as a rodeo rider, the decision to enlist in the best military unit in the world, the SEALs.